“What should we eat?” That is the question I have to ask myself every single day for morning, lunch, and dinner. It’s tough figuring out what to cook all the time, especially when time and energy are lacking. Leftovers are great but those only last 1-2 meals. We could get fast food but we tend to feel kind of nasty inside whenever we eat that. So, a nice medium is mixing fresh ingredients with prepared food like frozen chicken. 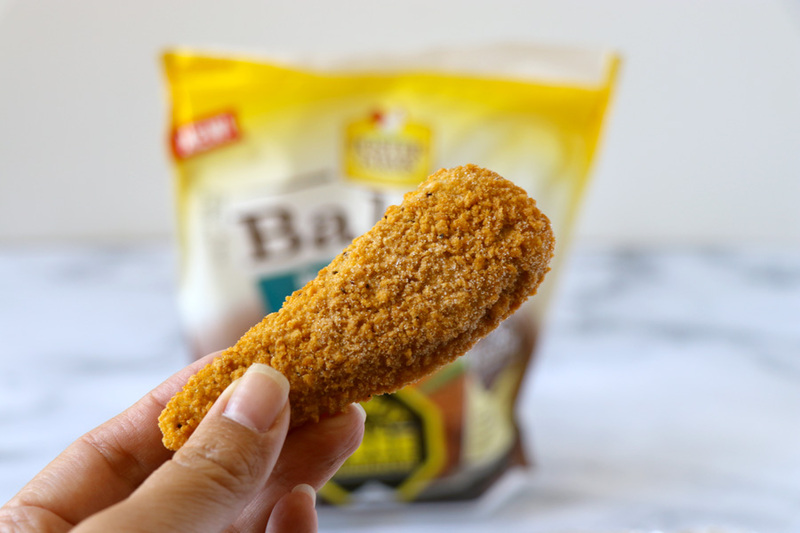 We recently discovered Foster Farms Baked frozen chicken. 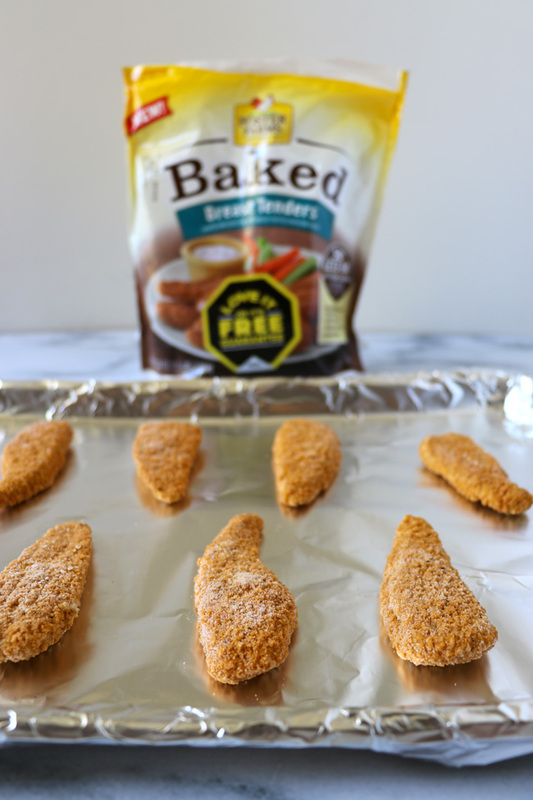 This line of breaded frozen chicken is baked and never fried. We all know how much healthier food is when it’s baked versus being fried. According to Foster Farms, their Baked version has 50% less fat and 25% fewer calories. I’m all for both of those! These do have gluten in them so only Munchkin and I eat them. Even though the manner of cooking is different, we still found the chicken to be crispy and tasty. Also, I liked that the breading isn’t too salty or over-seasoned. You can actually taste the meat instead of only the breading. Of course, the meat itself is the same all natural chicken with no added hormones or steroids you expect from Foster Farms. The breast meat is tender and perfectly cooked. It also has the texture of real chicken and not that artificial stuff you find in other products. I was only able to find the Foster Farms Baked Chicken Breast Tenders at the grocery store near me. These are brand new so they’re not as well-stocked as other Foster Farms frozen chicken goods yet. That’s fine by me though. I actually prefer Chicken Breast Tenders. These are super versatile and can be added many types of meals. Or, you can eat them straight with your favorite dipping sauce (i.e. barbecue sauce or ranch dressing). 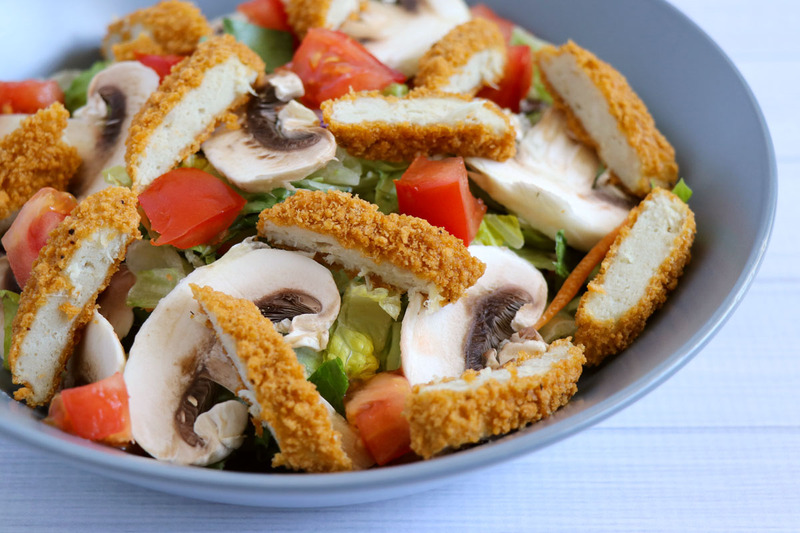 Tenders also work great as an added protein for your favorite salad creations! You can heat the Foster Farms Baked Chicken in the oven or in the microwave. We prefer to cook it in the oven since the chicken retains that nice crispiness. In the oven, it only takes 12-15 minutes at 400℉. The first time I made it, I cooked the chicken for 15 minutes. I think that was a little too long since the chicken was a tiny bit dry. If you are in a rush or have growling tummies to fill in a hurry, you can pop the chicken in the microwave for 2-3 minutes. I’m so glad to have found Foster Farms Baked Chicken products. There are times when I’m too pooped to cook a full meal from scratch. But, that doesn’t mean I want to feed my family junk for the sake of convenience. Now I can easily whip up salad, pasta, rice, or other side, add Foster Farms Baked Chicken to it, and have food on the table in less than 30 minutes. That’s definitely doable! I only wish a gluten-free version was available so Frans could have some too! (Foster Farms does have a gluten-free breaded chicken that we eat but it’s not baked.) If you’d like to try Foster Farms Baked Chicken, check here for more information and a helpful $1.00 off coupon. 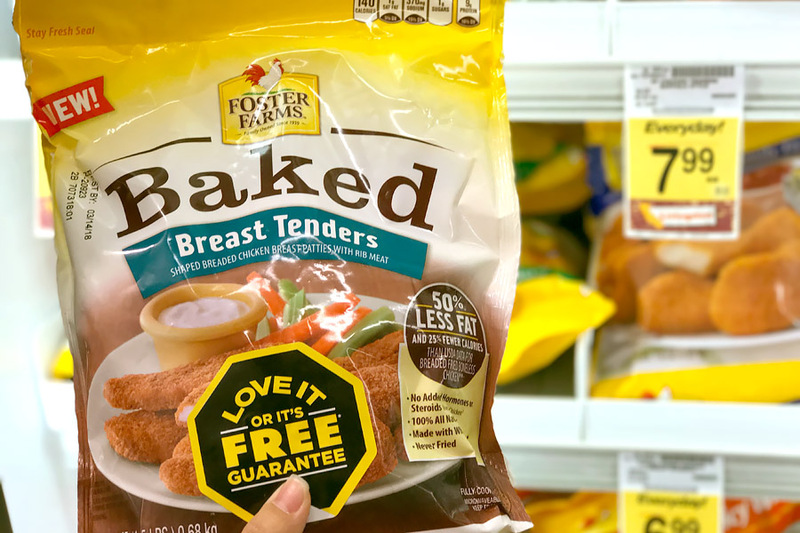 To help you stock up on this baked goodness, Foster Farms is generously offering one of my readers seven (7) coupons of Foster Farms Baked Chicken. Normally $9.99 each, this ends up being a total value of $70! These frozen chicken products are currently only available on the West Coast at participating retailers. So, only enter if you are in an area where stores carry Foster Farms Baked Chicken and you can redeem the coupons. Enter below! I was provided with product and compensated for this post and to host the giveaway. All opinions are my own. I would love to have honey with them. I would eat these with honey mustard dipping sauce. I would have it with my Honey Barbecue dipping sauce and have my sweet potato fries and a salad! I would pair this with a salad and have corn on the cob. BBQ sauce sounds great as a dipping sauce. We used Blue Cheese salad dressing for dipping chicken. YUM! Honey Mustard for dipping has always been my fav. I would make mashed potatoes and country gravy to eat with the strips. I would love to have them with honey mustard dipping sauce. I’d try these with some Asian Zing sauce from Buffalo Wild Wings. I would dip these in ketchup. I would like to dip them into some honey or sweet & sour sauce. Thanks. I would use it in a salad. I would dip them into some ranch dressing. Ranch or Thousand Island sound yummy! I would eat this with ketchup. I would make honey mustard sauce for dipping. Thanks so much. I would use honey mustard as dipping sauce. I would dip these in sweet n sour sauce! I would dip these in honey mustard sauce. I might make wraps with a ranch style dressing and plebnty of veggies with strips of chicken. I would use honey bbq. I would dip them in a jalapeno ranch dip. 🙂 Yum! I would use the backed chicken tenders and make a chicken parmesan with it. I would dip them in honey mustard sauce. I like to dip the nuggets in Ranch Salad Dressing ! We would make our own fry sauce to use for dipping. I would dip them in ranch. My boys prefer ketchup, though. I like to dip it in Honey Mustard sauce. I mix ketchup and mayo. Thanks for the giveaway!! I would eat these with a honey mustard dressing on a salad! Sweet & Sour and Hot Mustard Sauce! I would make a homemade honey mustard sauce and make chicken sandwiches with lettuce, tomato, pickle and onion. I think a honey mustard sauce or a sriracha aoli would taste very good. I would add them to a salad or just dip them in ranch! I would dip them in a honey mustard sauce. I would do a dipping sauce of honey bbq sauce. I would also make a side of noodles with it! I would eat them with a honey mustard dipping sauce, yummy! I would eat these Foster Farms Baked Chicken products with barbeque sauce! I would eat them with ranch. I’d use them with tacos. I would eat them with bbq sauce. I would enjoy dipping them in honey bbq sauce, yumm! I love honey mustard as dipping sauce. We would use ranch for dip! I would make a quick meal out of this with a bag of frozen veggies and some rice. Honey mustard or curry sauce for me. I would dip mine in honey and my husband like to dip his in hot sauce. I would make Chicken Parmesan with the Foster Farms baked chicken. I like dipping in bbq/ranch kind of mixed together. It’s a great flavor combo! Ranch or honey mustard, my kids love them both. I would have them with bbq sauce for dipping and sweet potatoes on the side. Perhaps some garlic green beans. I would use honey mustard dipping sauce. That would make a yummy combination. I would eat them with either ranch, ketchup, or spaghetti sauce. I prefer no sauce with my chicken. I would dip them in honey mustard! I would use the sweet n sour dipping sauce. I would make a sweet bourbon dipping sauce. Thanks! These would be great on salad or just alone. I would use honey mustard sauce or spicy wing sauce for dipping. I would eat these with blue cheese buffalo dip. Thanks for the chance. I would like it with a honey mustard dipping sauce, the perfect mix of sweet and sour. I would eat them with honey mustard. Those look crunchy and delicious! My family would love them!! i would eat these with a big salad with lots of fresh vegetables. I would like to serve these with pasta alfredo and roasted vegetables. I would love to try the Foster Farms Baked Chicken products with a honey mustard dipping sauce. That is my favorite combination. These would be good with anything! Ketchup, bbq sauce, or even honey mustard. I think I would try a honey product. Not sure which one yet. Although pure honey sounds the best. With this meal, my family would either use ranch dressing or blue cheese dressing for dipping sauce. My boys like honey mustard. We love these on sports nights, with lots of ketchup and ranch. Ranch from our local pizza place. bottled just doesn’t compare! I would love them with a ranch dip. I would make ranch or honey mustard 🙂 OH maybe I would make them buffalo style and serve with blue cheese and some carrots! 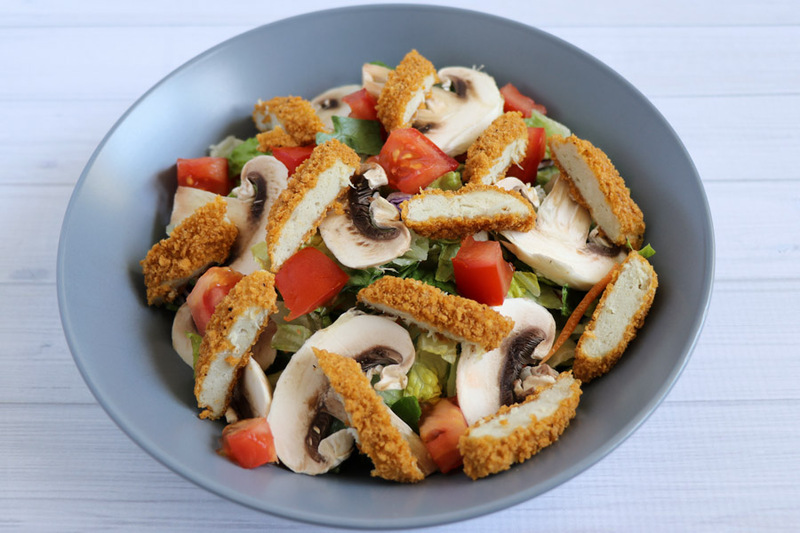 I love chicken strips over salad with ranch or honey mustard. YUM! I love to dip chicken in blue cheese dressing. I would love it with some buttered noodles. I would love to make a buffalo ranch dipping sauce yum! I would use honey mustard to dip them in YUMMY!!! I like to eat them in ranch dipping sauce. I would eat them in a garden salad with ranch dressing. I would definitely add to my Caesar Salad. would eat this with ketchup. I would use honey mustard with them! I would use ranch. Nothing beats it. I would dip them in Honey Mustard sauce! The person I would give the coupons to would probably just use ketchup. I would use blue cheese dressing. I would enjoy them with Ranch Dressing – YUM! A thick honey barbecue liquid would make my toes curl. WE would dip our chicken in Ranch dressing. I would dip them in sweet n sour sauce. I like sweet & sour sauce for dipping. I would dip them in some salsa or some ranch dressing. I would use ranch with them. I would eat some hot sauce with them ! I like honey mustard for dipping. Marie’s refrigerated thousand island dressing! I like the Baked Breast Tenders dinner the most of all of the fine Foster Farms Baked Chicken products choices available.